Who Put the Rainbow in the Wizard of Oz? 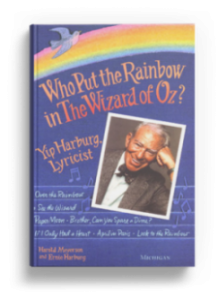 Many of us can sing along with Dorothy when she imagines a place “Over the Rainbow.” And we all remember the Depression-era classic “Brother, Can You Spare a Dime?” But very few can name the man who put the words to these celebrated hallmarks of American music- Yip Harburg. Five hundred songs spanning a fifty-year career bear witness to the brilliance of this until-now obscure figure. Plunge into this scrupulously documented volume and discover how Harburg, once a poet of light verse, played a major role in the transformation of the Broadway revue into the sophisticated musical of the 1940s and 1950s. With extensive and exclusive interviews and lyrical analysis, the authors capture Harburg’s wit, distinctive voice, and creative and collaborative methods. Inquiry into Harburg’s Jewish, New York City roots, apprenticeship in his craft, and involvement in the radical politics of the 1930s- he was blacklisted in the 1950s- puts into context the seemingly irreconcilable skepticism and optimism that contoured this lyrical genius’s life and work.